When Townsend Warren of McClellanville noticed Warren Island identified on a map of the area around St. Helena Sound in his May-June 2012 issue of SCW, he remembered his grandfather's stories about growing up on "Warren Island" and guessed correctly that the spot shown on the map indicated the same property described in a collection of Warren family letters and other papers from the 1800s. 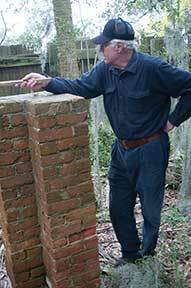 So at the age of 70, Warren arranged, for the first time ever, to visit the isolated lands of his ancestors, now a part of St. Helena Sound Heritage Preserve. The name John Warren appears on a jury list for St. Bartholomew Parish (now Colleton County) as early as 1760. 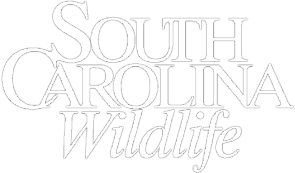 The Warren family farmed and lived on two small coastal islands, surrounded by salt marsh and cut off from the mainland by the Chehaw River for more than 175 years. A difficult and isolated life, but one they must have enjoyed. 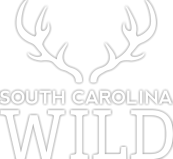 The Warrens (and a few other families) lived by choice in this remote part of South Carolina, isolated from most of the world and enduring all that nature could throw at them: tropical storms, sweltering heat and humidity, venomous snakes and hordes of biting insects. Despite the hardships, they found something alluring about this difficult place and thrived here, but the Warrens and their contemporaries weren't the first people to enjoy the "splendid isolation" offered by these islands. Shell mounds on some of the islands in St. Helena Sound bear witness to the fact that native people inhabited these islands thousands of years prior to European settlement. They also wouldn't be the last. 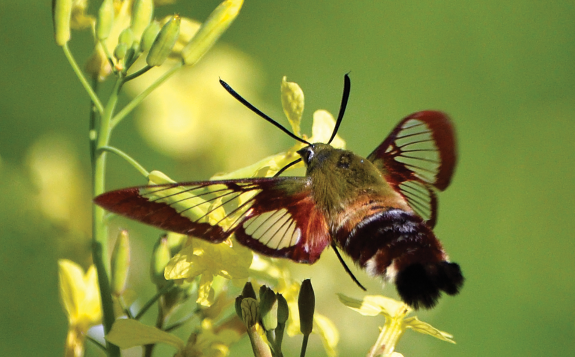 "The secluded and admirably adapted position of Buzzard Island renders it particularly adapted for a quarantine station." The report goes on to describe the site for the medical officer's new residence: "This location is one of great beauty, high above the highest pitch of tide and surrounded by a grove of live oaks, cedars and majestic palmettos." 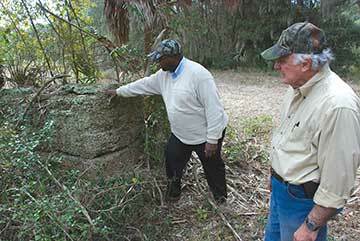 But by the early 1890s the boom of phosphate mining had moved on to larger deposits in Florida, leaving behind a scarred landscape still evident on South Williman after more than a hundred years. The quarantine officer's house burned years ago, but the foundation and an old cistern remain, still surrounded by the majestic trees. 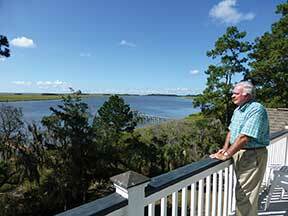 The Warren family sold Big and Warren islands in 1937 to Elliot Savage, a Walterboro saw mill owner. By then, improved roads on the mainland and the advent of the automobile had left these barrier islands even more isolated, and mostly uninhabited - with one exception: Fenwick Island. In the late 1800s, former slaves worked the fields of Fenwick, sandwiched between the Edisto and Ashepoo rivers, just across Mosquito Creek from Bennetts Point. As tenant farmers, they grew cotton and vegetables for market, peacefully removed from much of the social turmoil of the war's aftermath. One of these former slaves, David Smalls, who ran a boat delivering vegetables to Charleston, eventually acquired enough money to buy much of the island, which he later subdivided to other African-American families. In 1904, Smalls sold a twenty-four-acre strip of Fenwick to the U.S. Army Corps of Engineers for $700 for a section of the Intracoastal Waterway. The Corps dredged a canal across the island, slicing it in two and creating the "Fenwick Cut." Fenwick Cut further isolated the seventeen families living on what became known as South Fenwick Island, or by its old name, Seabrook. But just as the Warrens before them, these former slaves and their descendents seemed to relish their isolation. The last inhabitants did not leave South Fenwick for good until the 1970s, when the Samaritan Baptist Church, the island's social center, moved to Bennetts Point. S.C. Representative Kenneth Hodges grew up at Bennetts Point in the 1950s and 1960s, often rowing across the Cut to visit his grandfather and aunt on Seabrook, as he still calls it, and now represents the area in the state Legislature. Hodges remembers life on the island as slow and low-key, where the self-sufficient residents enjoyed freedom and natural beauty, and got along just fine without cars, electricity or the noise of 20th century "civilization." He still visits the island occasionally and likes to point out fields where his ancestors grew potatoes, watermelons, cantaloupes and other vegetables. 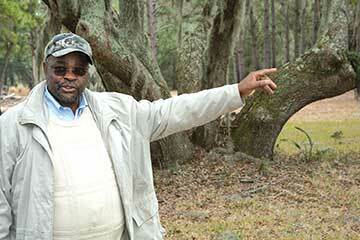 "My grandfather used to say he went to Walterboro only for sugar," he remembers. At the spot where his grandmother's house once stood, Hodges points out the big pecan trees and the chinaberry of his youth. "We always had a good breeze," he says, "you could look out at the water in any direction," recalling how the island had no docks - boats just landed on the mud flats - and how residents lived closely attuned to the rise and fall of the tides. South Fenwick residents built their own wooden bateaus, propelled by oars until outboard engines became widely available in the 1960s, and the brackish waters of the Ashepoo and South Edisto rivers offered ideal habitat for blue crabs. 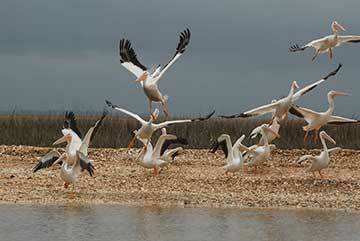 According to Hodges, most of the island's able bodied men, and some women, crabbed from early spring to late fall. 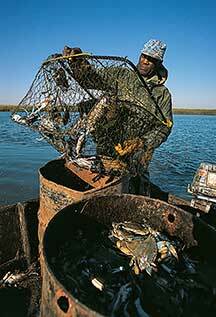 In the early days, crabbers set out long lines with scraps of beef they called "bull nose" tied every few feet. Each morning, crabbers worked their bateaus along the lines, carefully dipping up crabs that clung to the bait and hauling their fresh catch to Beaufort by truck in 55-gallon drums. 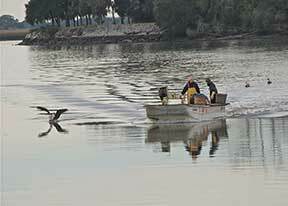 In the 1960s, the advent of wire traps made the fishery much more efficient. One legendary area crabber, Capers Smalls, died recently at the age of 100. Smalls and his wife raised eight grandchildren, the youngest of which, Jimmy Dais, has lived all his life at Bennetts Point. Dais also remembers weekends spent on South Fenwick as a boy. "On Saturday afternoons, as a reward for getting my grandfather's boat cleaned up from the morning's crabbing, I could take it over to South Fenwick and stay until Sunday," recounts Dais, where he'd spend time fishing, crabbing, swimming and playing with the island children, many of them relatives. "The kids from Seabrook never wanted to come over here to Bennetts Point," says Dais. Now in his sixties and partially disabled, Dais spends most of his days on the porch of his modest home at Bennetts Point. Here, life still moves at a slow pace, in tune with the rise and fall of the tide. "I never had any desire to go to New York the way a lot of them did," he says of his boyhood friends. "I love it here. They can't get me to leave." Another area resident by choice, former state Senator Dewey Wise, bought a large part of South Fenwick in 1984 and now owns four hundred of the island's five hundred acres. He lives just across the Cut, on sparsely populated Fenwick Island, in a house he built overlooking the Ashepoo River. "This same view will still exist a hundred years from now, with no development, no shopping centers, no changes at all," says Wise, one of the authors of the state's landmark Coastal Zone Management Act of 1977. Wise's chosen isolation does, however, present some challenges. From his house, a dirt track first crosses a narrow concrete bridge connecting Fenwick to Musselboro Island, and then a small wooden bridge connects Musselboro to the mainland. From there, Wise still has quite a long drive to the nearest grocery store. He and his wife plan their trips carefully and eat a lot of venison. Their few neighbors, all of whom, Wise says, love nature and cherish the peace and quiet, keep them supplied with shrimp, fish and eggs. Many evenings he and his wife sit on their dock, watching the sun set in pastel shades of pink and purple. "It's the most peaceful feeling you could possibly have," says Wise. One can easily picture the members of the Warren family, just a few miles away, watching those same sunsets two hundred years ago, but while Wise and his neighbors cope with physical isolation, unlike previous generations, thanks to modern technology they remain very much connected to the mainland via the internet, cell phones and cable television. 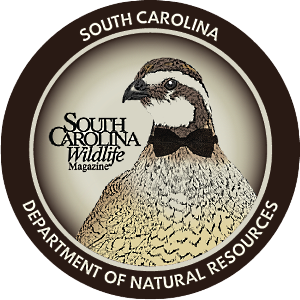 Although Fenwick and South Fenwick remain in private hands, the S.C. Department of Natural Resources now owns Warren Island and the surrounding islands of Big, Beet, Ashe, Otter, Buzzard, North and South Williman and Morgan. 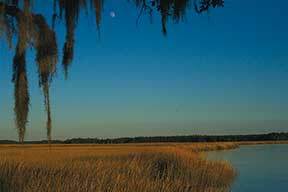 Together they comprise about 25,000 acres in the core of what is today the ACE Basin National Estuarine Research Reserve (NERR). Approaching Warren Island on a small boat, Townsend Warren watched for the first time the low, tree-covered island of his ancestors come into view on the east side of the Combahee River. 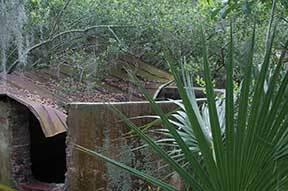 Landing near the island's south end, he spent a spring morning pushing his way through young palmettos, second growth pine and yaupon holly, and skirting puddles in the skidder ruts still visible from the last logging here twenty-five years ago. Overhead, yellow-throated warblers sang incessantly, while Carolina wrens called cautiously from the thick understory. 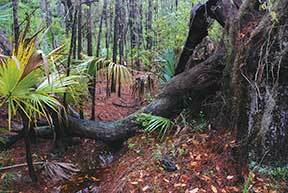 Mosquitoes and sand gnats swarmed the island's marshy edges, softened by a misting rain. 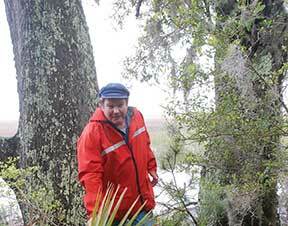 On a bluff facing east across the salt marsh, he came upon several large live oaks draped with Spanish moss and two ancient blueberry bushes, possibly the site of the Warren ancestral home, though no visible artifacts could confirm it. Undaunted, Warren said, "I did not really expect to find anything. Just knowing I put my feet on this ground is good enough for me. I can say I did it, anyway." Gazing out across the vast horizon of salt marsh, interrupted only by the occasional distant clump of tree-covered island, he perhaps got just a brief sense of the isolated lives of his long ago ancestors. From the Warrens living the plantation life, to the Smalls farming and crabbing on Fenwick, to the Wises relishing a quiet retirement, like-minded South Carolinians for generations have enjoyed life on these remote islands that today remain as splendidly isolated as ever. 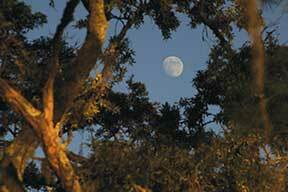 Longtime SCW contributor Pete Laurie is a freelance writer living on John's Island.